I am working on post about Autism and Bipolar for you. It is getting late and I have lots more to do on it. I will finish it for tomorrow. For today here is an example of Billy Ray's community activities. He went to the church to do some volunteer tasks and out to lunch with his support staff. 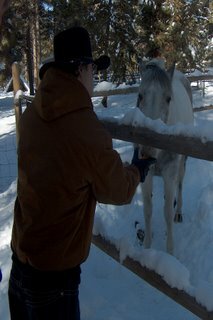 Then as a treat he goes to visit a horse named Cloud owned by a waitress we met here in LaPine. Most days Billy Ray goes to visit Cloud and brings it a carrott. Cloud really seems to enjoy the visits as much as Billy Ray does now. Billy Ray is going to be 23 on Monday. I will try to get a picture at his birthday celebration. We will see if he co-operates. I can't wait to see the birthday pictures, I hope you are able to get some of Billy Ray. I am looking forward to the post for tomorrow on autism and Bipolar. Hope you're having a great day.